Directions: Grand Teton National Park is just north of Jackson, Wyoming and is easily accessible by car. The park is 9-10 hours from Denver, Colorado and 5-6 hours from Salt Lake City, Utah. There is an airport located in the park should driving not be an viable option. Great photography opportunities can be found on US 191 while driving through the park. 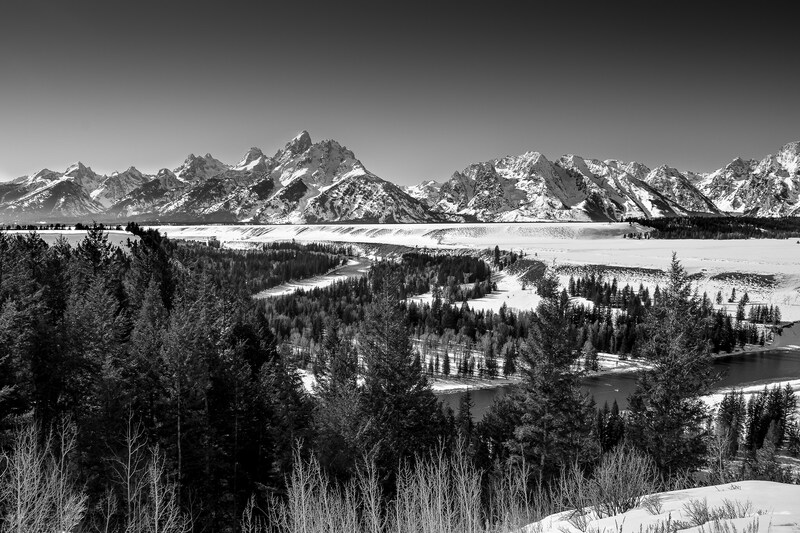 The area surrounding Grand Teton National Park includes some of the most photographed landscape locations in Wyoming such as the Snake River overlook and John Moulton’s barn. The landscape changes dramatically between winter and summer and serves as an excellent subject year around. The Snake River overlook off US 191 offers a classic landscape shot by such artists as Ansel Adams and features a designated parking area for access. Time of Day: The sun rises from behind the mountains yielding a silhouette effect for mountains and creating dramatic colors in the sky. Shooting at dusk blankets the Tetons and the foreground of the river in warm light. Both dawn and dusk are great times to photograph this landscape depending on your artistic objective. Gear Tips: Bring a tripod and a wide angle lens. Depending on the time of day you may have to shoot multiple exposures to capture all the detail required for your photo. Also, weather can change dramatically so please bring layers of clothing if shooting in the winter. There is some misinformation above! The sun does not rise from behind the tetons at the snake river overlook, it sets behind the tetons. Best time to from this overlook is sunrise!!!! You cannot exactly duplicate Adams’ shot, primarily because trees have grown up. I plan to revisit because my first effort with a digital camera looks flat in black and white. But the overlook is really convenient.